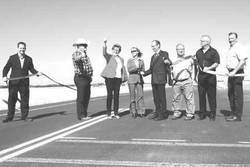 On Sept. 16th Leduc County Officials were thrilled to be able to cut the ribbon on RR 263 once again opening it to traffic. The complete upgrading of the eight kilometre stretch of this road between Glen Park Road and Hwy 39 has taken 3 years to complete at a cost of $7.7 million dollars. “Road infrastructure is crucial to our local economy as it connects workers with jobs, and products with markets. Improvements to transportation infrastructure are important for the well-being of our communities,” said MP James Rajotte.